The maps below should help you understand the location of Bermuda's Kings Wharf dock and the Royal Naval Dockyard, and how the whole port is laid out. The dockyard once used to be a British navy base and therefore known as the Royal Naval Dockyard. The inset in the first map shows you where Bermuda is located with respect to the US east coast. The big red star on the first map shows the location of the dockyard in Bermuda. As you can see in the map, the dockyard is located at the western tip of Bermuda in Ireland Island (north) in Sandy's Parish. There are two berths at the dockyard here. Kings Wharf is the original berth (or the dock), Heritage Wharf is a latter addition and located next to Kings Wharf. The second map below shows details of the Kings Wharf cruise pier and the Dockyard complex. Earlier Kings Wharf used to be the only berth where the cruise ships could dock. Now there is an additional berth called the Heritage Wharf created which is located right next to the Kings Wharf. So two large ships (each with capacity of over 3,000 passengers) can now dock here at the same time. 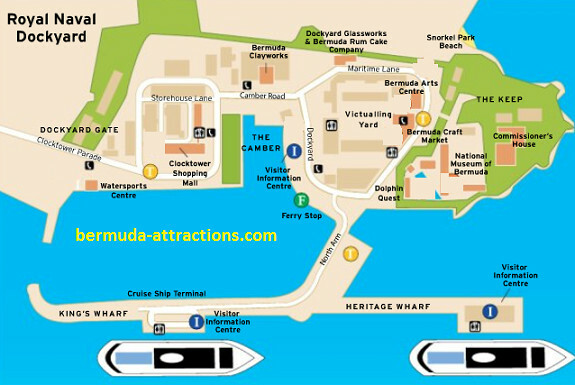 Here are some of the main tourist attractions within the Dockyard complex most of which you can locate in the map above. Apart from many exhibits and artifacts that depict Bermuda's history & culture, here you can know about the fascinating story of Bermuda's maritime heritage. A collection of boutique retail stores in the clocktower building. This manmade family beach located at Royal Naval Dockyard is great for snorkeling. This is a great Dolphin display and training center. If you have a dream to swim with dolphins, touch or feed them, there is no better place than this one. Located in the cooperage building within the dockyard, the craft market has an array of local art and handcraft items that are excellent as souvenirs. Here you can see craftsmen display their skills and making excellent glassware items. There are resident artists and you can have chat with them to understand their artwork and buy the ones of your interest. Located on Camber Road, this is a working studio and gallery of fine ceramics created by the resident local and international artists. This is a nice pub and restaurant inside the dockyard complex. Find out complete details of the dockyard complex with all its attractions, activities, history, pictures, video and lot more.